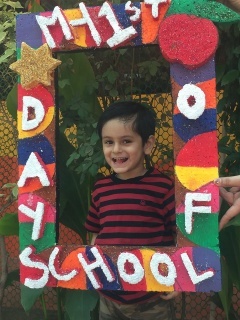 We at Discovery Montessori, work towards investing early days of child’s life by capitalizing them to the maximum. We strive on making our children self confident, empathetic and global citizens of the future. Our authentic Montessori and American Curriculum helps our children to inculcate good habits of Mannerism, Etiquettes , life skills and grooming. We are equipped with the four defined practical learning areas of Montessori Lab, Tab Lab, Play Arena and Sporty todz gym. 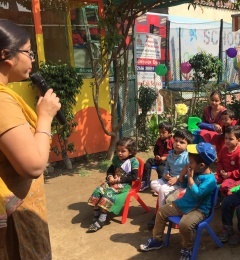 The wow factor about our school is the lush green area , fully AC classrooms, AC transportation, 24x7 CCTV service. 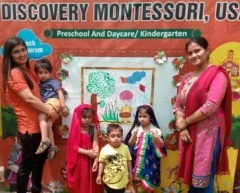 Our USP is USA based curriculum, trained Montessori teachers and Certificate by Discovery Montessori Preschool and Daycare, USA.